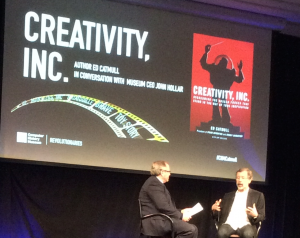 Catmull’s had two childhood idols: Einstein and Disney. Both, he said, do work based on acute observation. His original ambition in life was to be an illustrator- a dream that was crushed when he discovered he couldn’t draw. That’s when he turned to CS and physics for his studies, eventually earning a Ph.D. in Computer Science. His classmates included James Clark (founder of Netscape), John Warnock (founder of Adobe) and Alan Kay (the guru of PARC in its heyday). In the course of his studies, he discovered the ability to draw with computer programs, allowing him to merge his seemingly unrelated passions. When George Lucas, following his success with Star Wars, wanted to utilize computer graphics to enhance future productions, he interviewed Catmull as a possible head of this new venture. At the end of the interview, Lucas asked him who else might be appropriate for the job (for which Ed was being interviewed). So, Catmull provided names of people he thought might be matches. Turns out- Lucas asked all the applicants the same question (and, by the way- had spoken to most of them already). Ed was the only one to provide recommendations. And- he got the job. Eventually, the group he headed became Pixar Animation. In the beginning, the initial team had to learn on the fly. There were a lot of mistakes/failures along the way. What he thinks led to their ultimate success was that the original team stayed together after experiencing failures so they could all benefit from the learning that came out of failures. In the beginning, “All of our babies are ugly. It’s messy getting to the final product.” That’s typical of the creative process. As a manager, it’s his role to protect the ‘ugly baby’ long enough to allow it time to pretty itself up enough to be viable. As a manager of creative people engaged in a creative process, it’s important to be aware of what is hidden and to see connections when they arise in places that are unexpected. When problems arise, attention needs to be on “what can we do to fix this thing’ rather than looking to lay blame or giving up. Catmull shares a lot more advice on how to create and sustain a creative culture in his recently published book, CREATIVITY, INC: Overcoming the Unseen Forces that Stand in the Way of True Inspiration. It is now next on my list of readings.